Fond memories of MSS and singing our school song.never forgot it. Yes….. fond and sweet memories. Still can remember the song by hard. 2nd line should read : Amidst broad fields of rice…. “Hail to MSS” is the old version……..which we oldies prefer coz already used to it…! 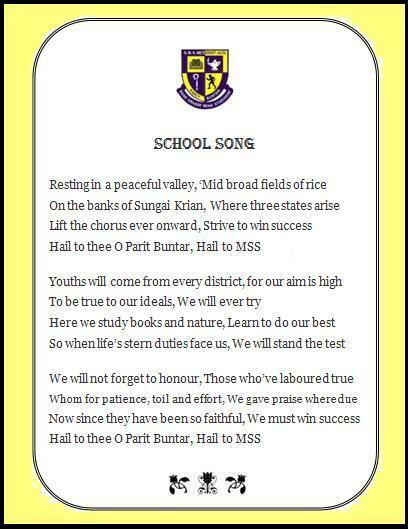 Remember singing this song not too long ago, or though it seems.Time flies.That line” So when life’s stern duties face us, we will stand the test “, never made sense until each of us left school to face the TEST of life.How true the song writer was and the far sightedness.Hail to MSS. YES YES… WE LOVE OUR MSS…… CLASS OF 1981…..